LAST WEEK'S GOALS... So technically there were no goals last week because I didn't post any but for the sake of congruence I'm titling this section 'Last Week'. Anyway, did I achieve any of them? Well I did manage to get my roots sorted. I bought a DIY dye kit (even though I swore I wouldn't touch one again - the hairdresser is expensive though) and have managed to get them sorted. I went a couple of shades lighter than I usually do but I really like it and as I've been tanning recently (shock horror - I don't usually touch fake tan!) it seems to look healthier than the usual dark-hair-pale-skin I sport. I never quite got around to listing three things I like about myself every day but that isn't because I couldn't think of any - it was because I was so busy. I did manage some though and I keep them in my purse for when I'm feeling a little low on confidence. Keeping the house tidy and mess-free was hard work when I live with a man that creates a mushroom cloud of dust every time he enters a room. I did my best but it wasn't good enough so I'm spending my days off cleaning at the moment. I have managed to laugh a lot recently and I put this down to my work colleagues. I started a new job in October and have since had a new manager who makes me laugh a lot and my other colleagues are hilarious too. I'm really enjoying it. Also, my dad has made me laugh a lot too so that's good. And as for spending time with the cat? As I write this she's snuggled besides me purring. She still prefers Dave to me but since I started petting her some more she has decided to sit on my knee more often and has even bothered to say 'hello' when I come in from work instead of just ignoring me. So I would say I achieved 3/5 over the past couple of weeks which isn't that bad considering how hectic life has been. 1. STICK TO THE MEAL PLAN In an effort to get organised and save some money I've drawn up a meal plan for the next two weeks (until we get another pay day). I'm one of those people that has to motivate myself to cook when I can't be bothered and a lot of the time, when we have some spare cash, I'll simply order a takeaway instead. I worked out I've been spending £200 on takeaways per month, over the past couple of months, and it shocked me. Now we have a meal plan and everything is already in the cupboards so I have no excuse not to stick to it. 2. STOP DRINKING SO MUCH COFFEE I am a complete coffee fiend but it really isn't good for me. No matter what I do I seem to gravitate back to coffee every time I'm faced with a choice. I've removed all coffee items from my house and I'm going to try to avoid it for a whole week. Wish me luck. 3. GET THE REST OF THE PRESENTS WRAPPED UP I've been procrastinating over wrapping Christmas gifts. This is mostly because I haven't really been that bothered about Christmas until my niece came round to help me decorate the tree (post on this to follow). They've been playing Christmas songs in my work since October (over kill much?) and I don't buy advent calendars so I guess I've been a little immune to all of the Christmas cheer this year. Anyway, I need to kick myself into gear and get it all wrapped up (excuse the pun). 4. SORT THIS BLOG AND SOCIAL MEDIA OUT I haven't posted for two weeks which isn't like me at all (if you're a regular reader you'll know I throw as much content out as possible). I've been trying to find a schedule to work with as I get more hours at work (I've gone from a 10 hour contract to working over double that every week - I'm not complaining but it really has messed up my routine somewhat). I want to post regularly with the same kind of content each week so readers can pick and choose what they want to read regularly. This also includes social media. I used to be really active on Twitter but after a couple of burns I stepped away from it. I'll be back to normal completely by new year but I'll be making the effort to get something posted for the next few weeks. I promise. 5. GET MYSELF A PARTY-PERFECT LOOK As it's the festive season I'm being invited to different events. I want to look groomed and ready when I go to these things but so far I have a wardrobe of slouchy tops and skinny jeans. I need to find the perfect party dress to wear to Christmas do's. It has to be work appropriate too (just in case my colleagues and I decide to go for drinks or something) and also for a couple of nights out. Suggestions welcome. 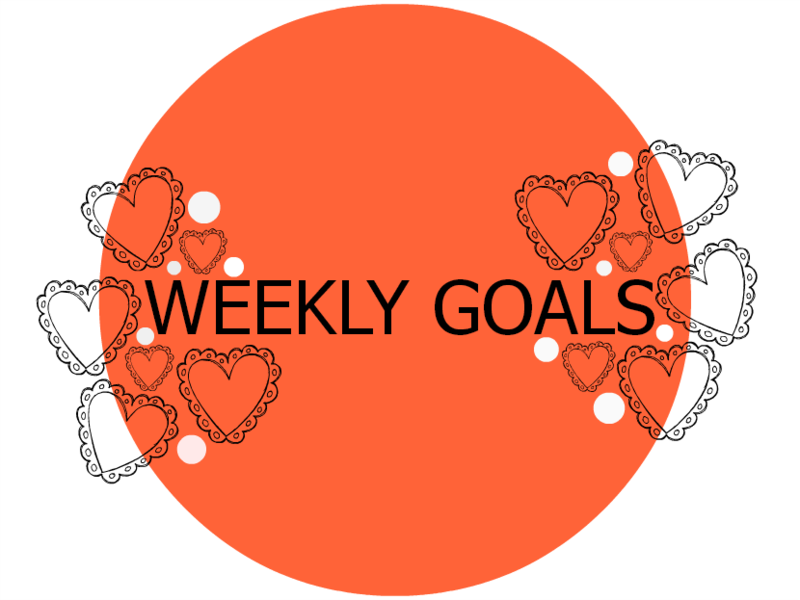 Do you have any goals this week? I miss your twitter presence!